Students can no longer use the excuse that the dog ate their homework. Microsoft has made life easier with its many templates and there is one specifically designed with students in mind, the Student Assignment Planner. It allows them to enter assignments into a table and most importantly, they are able to view due dates. The good news is that the template is available for free on this page, it is customizable and it is easy to use. First, download the template by clicking on the link provided. Second, open and save to your desktop or device such as a flash drive. Third, scroll to the bottom and look at the worksheet tabs, ‘Assignments’, ‘Month View’ and ‘Week View’. Fourth, click on the ‘Assignments tab’ first. Click in each cell that is – labeled e. g.,’Assignment’ and write over the placeholder text and then click in the date field and enter the date for that assignment. 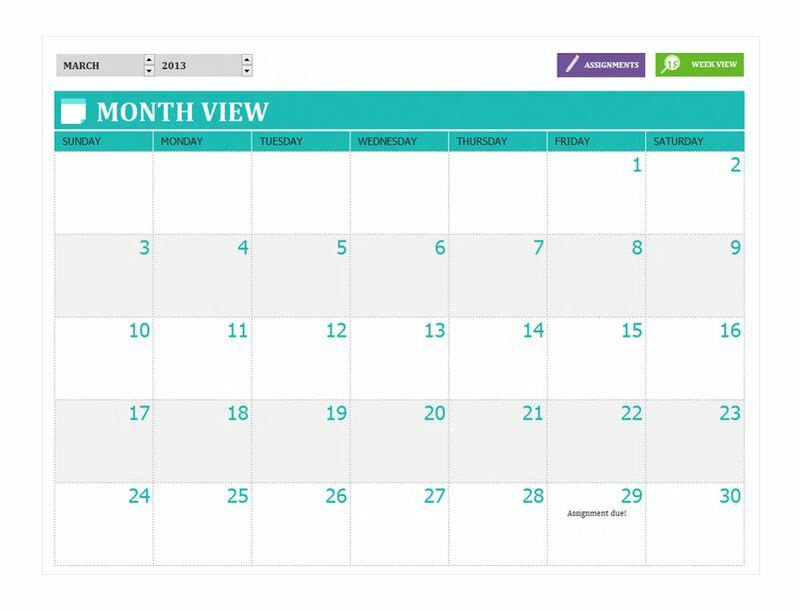 Fifth, click on the ‘Month View’ tab and the assignments for each subject by month can be viewed. It gives students a good overview of their workload for that time period. Sixth, click on the ‘Week View’ tab and the assignments due that week are right at hand. First, be sure and save the Student Assignment Planner template to your desktop or to documents folder, as it can be used over and over each week or month by simply clicking on the fields as indicated above. Second, once it is downloaded, rename the working file for the week or month that is being overwritten, e. .g. January, 2013 or Jan_2013_ Week_one. Third, be sure to save your last entries. Fourth, whenever a new month or week is being worked open the template and go to File, then Save as, and rename it with a name that is easy to remember and that identifies the particular assignment. All students can benefit from the Student Assignment Planner template. To get your free download, follow this link. Not only will students be able to look back at the work they have accomplished, but now they can also take personal control of their studies by keeping proper records. Also, they are able to establish a great relationship with their teachers by never missing an assignment deadline. Using the Student Assignment Planner is a great way to stay organized and develop a good work ethic.